If you have had restorations, orthodontia, or a complete smile makeover, you want people to notice the final outcome – your beautiful smile. There is a lot, however, that is going on behind the scenes. Today’s post talks about three important smile makeover components that are not readily apparent when you smile, but are often necessary for the successful result. Not everyone in Clackamas wants to flash a metal smile while their teeth are being straightened. 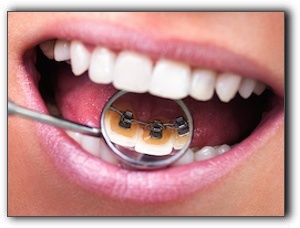 Invisible braces keep your secret safe because it is nearly impossible to see them while they are being worn. A dental implant is a metal (usually titanium) rod implanted into the bone to replace the missing root after a tooth extraction. The crown and supporting structure are securely and permanently attached to the post. Titanium is super strong and well tolerated by the jaw bone. When the final crown is placed, your new tooth is indistinguishable from the others. Dental implants have many critical advantages over dental crowns. If you are missing teeth, schedule a consultation with Dr. Brian Westover DMD and Robert Kowal DDS to discuss your options. Brookside Dental is located at 9225 SE Sunnyside Rd Ste 1 in Clackamas. We have been providing quality dental care since 2011. Call us today at 503-905-3380.